Avalara Integration in Zoho Subscriptions is an alternative to the manual method of determining and associating sales tax rates to your transactions. With the new Avalara integration, Zoho Subscriptions not only automates your final calculations but also fetches the right tax rates and exemption reasons for all your transactions. Note: When you integrate with Avalara, your Address, Country and Avalara credentials such as Account Number, License Key, Company Code and Mode will be shared with them. Avarala can be enabled only if Accrual is selected as the organization’s Tax Basis. Make sure you have an account in Avalara. You can create tax codes for your organization there and use these later in Zoho Subscriptions. Enter the credentials required to set up the integration here. If no company code is provided, the default company in Avalara will be integrated with Zoho Subscriptions. While entering your Avalara credentials (such as Account Number, License Key and Company Code), select Development against Mode if you have a sandbox account in Avalara. If not, select Production. Sign into your Zoho Subscriptions account. Click on Gear icon > Taxes. 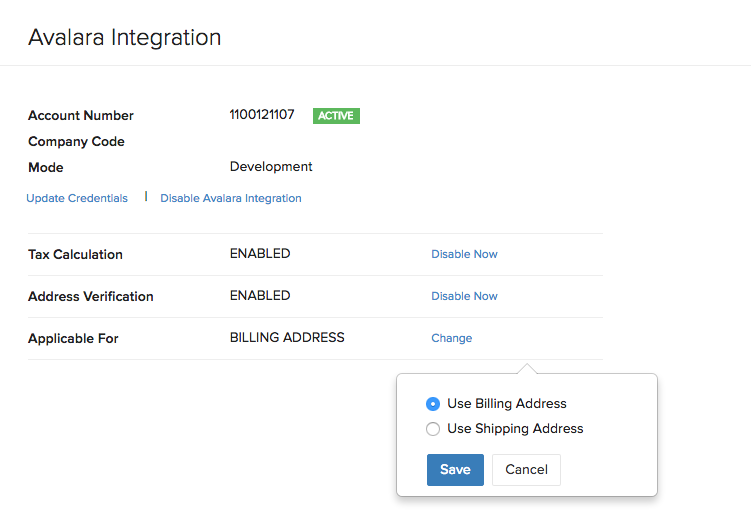 Now, click on the Use Avalara Integration button in the top right corner. Enter your Avalara credentials and save them to get started. While creating or editing a plan, under the Tax code field, reproduce the appropriate tax code for that plan as provided by Avalara. Once a tax code is associated in Zoho Subscriptions, Avalara will use a combination of this and the address of the customer to determine the taxability status of the plan (tax exempt, partially or fully taxable) in your customer’s location. Click on the Customers tab in Zoho Subscriptions. Select the + New button to create a new contact or edit an existing contact. Provide a valid address for the customer under the Address sub tab, ensuring authenticity in the street name and zip code that you provide. If the customer is tax-exempt, enter the Exemption Number. Customers located outside USA (such as the European union) are eligible for VAT handling. When a currency apart from USD is selected for a customer, you will be asked to specify the country and VAT ID. This information is used to handle all VAT calculations for this contact. Address : Providing a valid address which Avalara can verify using geolocation technology will ensure that you’ve fetched the exact tax rates pertaining to the customer. Exemption Number/Entity Code : If you’re dealing with a customer who does not need to pay sales tax (say a non-profit organization), you can simply add or select the right entity code from the list corresponding to the exemption status of the customer. Alternatively, if the customer possesses an exemption certificate issued by the government, the number on that certificate i.e the exemption number will suffice to make that customer exempt from all tax calculations in Zoho Subscriptions. VAT ID : Tax rates of customers located in European Union will be fetched and stored using the VAT ID and country details provided during contact creation. VAT jurisdictions will be enabled for your organization only if it’s requested for when signing up for AvaTax. Learn more about VAT Transactions in Avalara here. Note : You can change the entity code, exemption number or contact address anytime within a transaction, right from their respective fields before saving it. Determines the product and its plan’s taxability in the customer’s location. Determines if the customer is taxable or not. Fetches precise tax rates for the transaction by mapping to the right jurisdiction in that location. You can always change the plan and customer tax criteria while creating a new transaction as well. This is handy for isolated transactions where you might need to make a normally taxable customer tax exempt, or you’re shipping to a different address for a regular customer. Navigate to Gear icon > Taxes. Click on the Update Credentials button and enter your new credentials and click on Save. 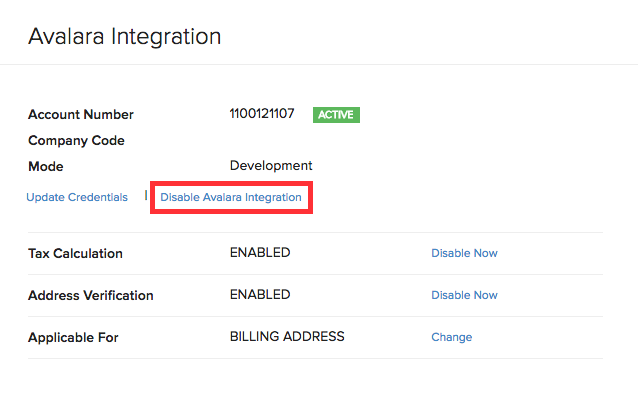 Click on the Disable Avalara Integration button to completely disable it. Once disabled, you can revert back to use manual tax rates. Disable Address Verification - Address of your customers will not be verified by Avalara. Disable Tax Calculation - Taxes will not be calculated on any transaction created once this option is chosen. Also, you can choose the address for which the tax is applicable by clicking on Change against the option Applicable For. Select either Use Billing Address or Use Shipping Address and click Save. 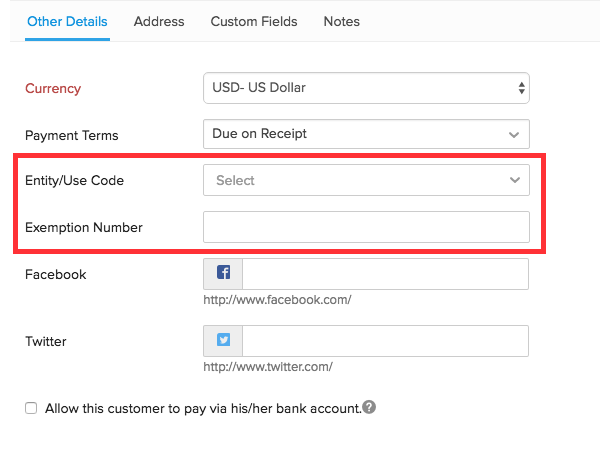 If a subscription is created and an invoice is raised after changing this setting, the address used for tax calculation on sales transactions will be based on the chosen address. 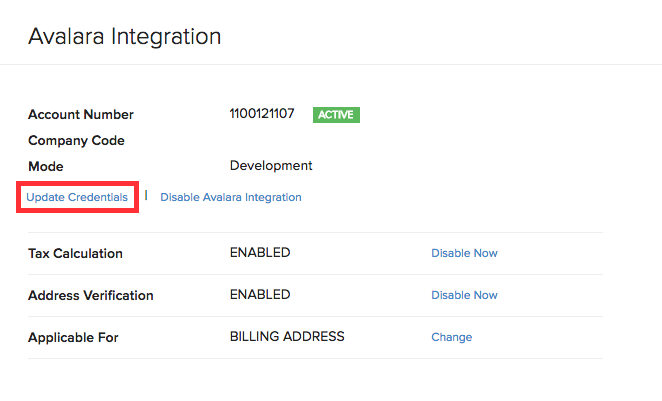 Note : Avalara integration cannot be disabled if any active subscription uses Avalara. You have to cancel the subscription manually and try again.